The ostensible excuse for finally making a real effort on this project and actually sorting through everything and even throwing things away is that my son is leaving very soon to study abroad for a year and we need a place to store his car, but everyone knows that the real reason – the truth – is that I am hoping to, at long last, get my priorities straight and start an all-grain home brewery out there. My long-suffering and amazingly tolerant wife and I had already sorted through several boxes of child-size sporting equipment, shoes and boots, and other items we no longer need to keep on hand when I came across a box of bottles wrapped in paper. Imagine my surprise and wonder as among a few old liquor bottles – half-empty vessels of scotch, schnapps, tequila, and cognac with masking tape wrapped around the stoppers – I slowly unwrapped eleven bottles of a raspberry ginger mead I brewed in 1995. I had forgotten it was there. Already eight years old when we moved to Nashville, these eleven bottles have weathered more than ten years in the garage – ten hot summers that have pushed the mercury close to or over 100°F every year, and ten winters, which go below freezing at some point each year. This year it was so cold for Nashville – hovering below 10°F – that municipal authorities closed school for most of a week. The result of this find has been an unlooked for flood of memories. When I brewed and bottled this mead, my son (who is now an adult) was a toddler, and my now teenaged daughter would not be born for more than five years. Bill Clinton was still serving his first term as President, and the 9/11 attacks – which were to influence and change many aspects of life in the United States – were nearly six years in the future. For my family, the intervening years have seen four household moves and many changes of employment for both me and my wife. We went from being fledgling parents to being the oldest couple in the room at some school meetings, and together we have shared the daily grind of delivering them to and from school, music lessons and rehearsals, martial arts and sports practices, parties. There have been family vacations and emergency room visits, illnesses, disappointments, triumphs. I finished a college degree and went to graduate school years later to earn a certification. I served a total of nine years on the boards of two nonprofit corporations, saw my work published for the first time, and had difficulties with more than one employer. How many times have I revised my resume, or wished I had made different career choices! I have felt moments of surpassing joy and at times, come close to despair as the trials of adulthood slowly chipped away at many of the ideals of my youth, and I struggled to maintain my marriage, my relationships with those I care most for, and my own sense of self-worth. The Raspberry Ginger Mead was my Brew Day #22, brewed little more than a year after my first batch of home brew, and my second of only two batches of mead I have ever made. I may consider making a third now. 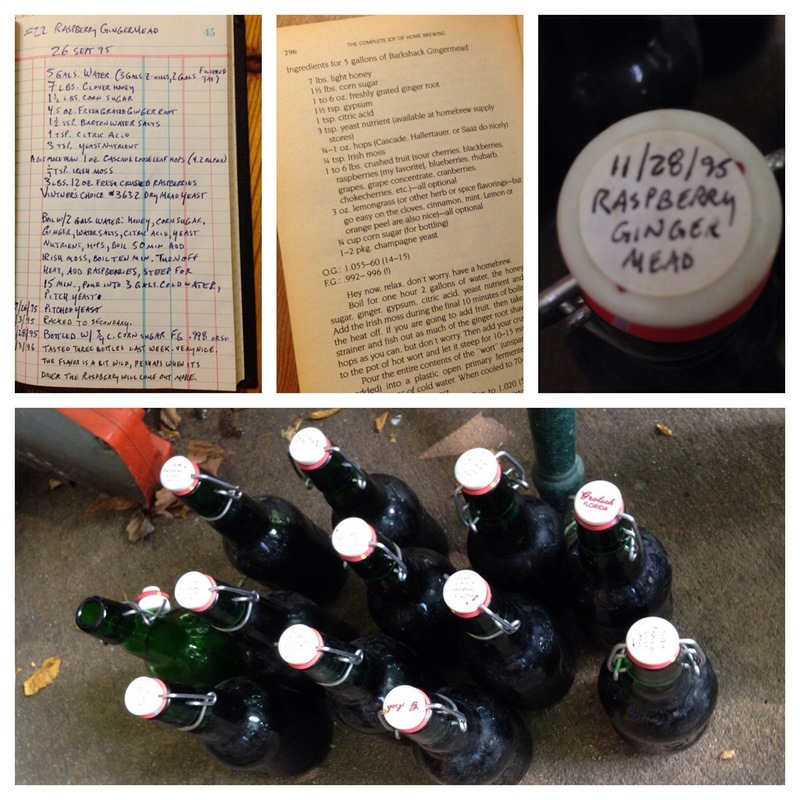 My first batch of mead was a Barkshack Gingermead, the recipe taken directly from Charlie Papazian‘s The Complete Joy of Home Brewing, brewed on New Year’s Eve, 1994. That was Brew Day # 14, and my notes indicate that it produced a dry, gingery, champagne-like beverage that must have inspired me so much that I made it again less than a year later, following the same recipe almost identically and this time adding nearly four pounds of fresh raspberries to the concentrated wort at the end of the boil. According to my notes I let the whole concoction steep for 15 minutes, then transferred it to the fermenter, diluted it, and pitched the yeast. Like many home brewers of my generation I cut my teeth on Charlie’s recipes, eventually weaning myself away over the years as I became more confident in my ability to formulate my own, but often returning (to this day) to read what Charlie has to say on this or that matter, to chuckle at his way of putting things, and to chant his mantra with him for old times’ sake. Yesterday when I looked up the recipe for Barkshack Gingermead (above) I smiled to see that he had thought it important to remind the home brewer to take it easy with this one especially, and headed off the directions with a dedicated reminder: “Hey now, relax, don’t worry, have a homebrew.” Since this mead is intended to be bottle-conditioned for a year or more, I suppose an even more relaxed attitude is called for. 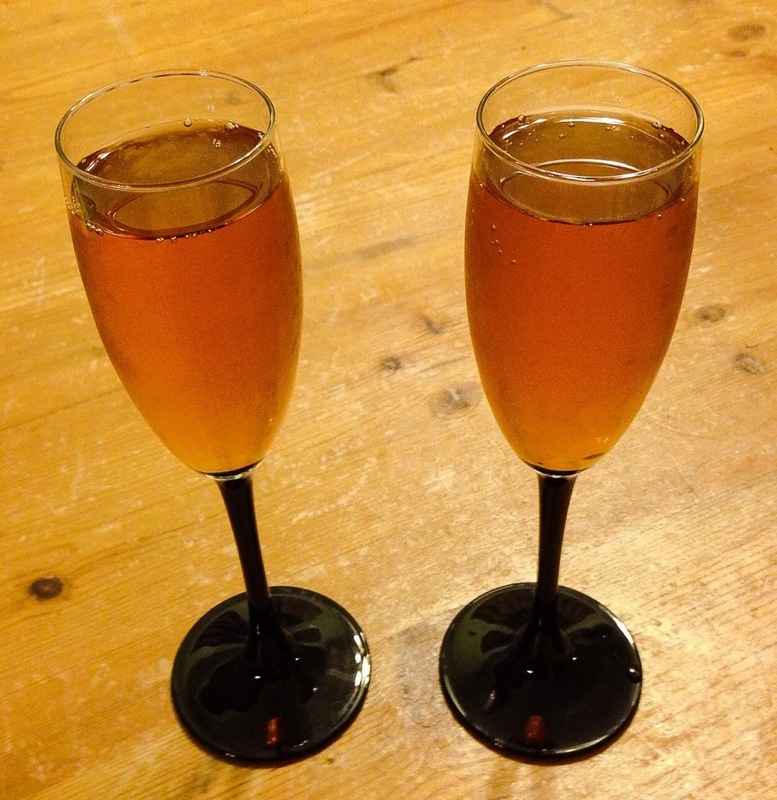 When I opened a bottle on Saturday night, the rubber gasket on the bottle – still the original Grolsch gasket – came free with a quiet pop, and the mead poured very clear into the flutes that seemed the best choice for this vintage. 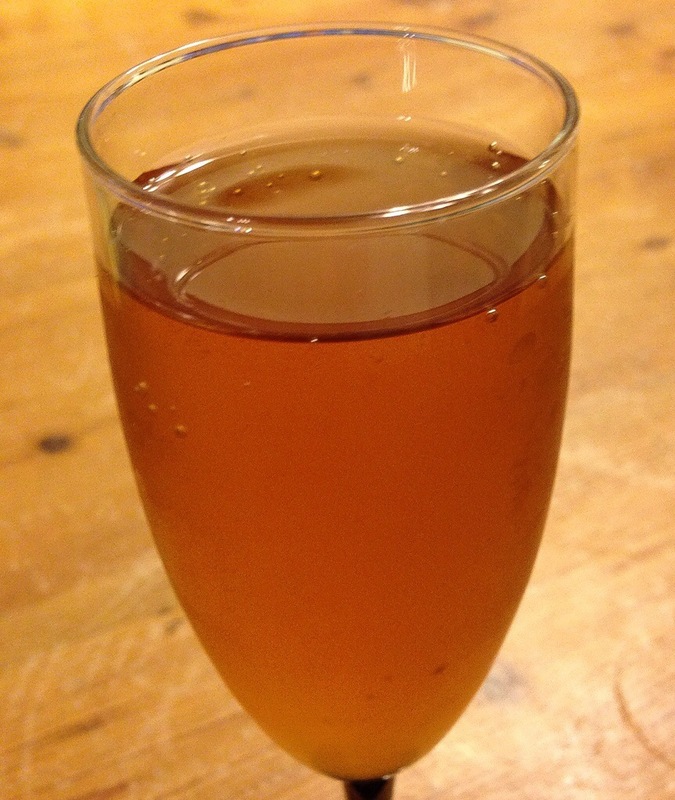 What was once a sparkling, effervescent mead is now still, but there is no evidence of oxidation, at least in the flavor. It is the color of golden honey, with the slightest tinge of pink, like a sunrise. Any presence of ginger left is only in the nose, and it is very faint. It is lighter in body than water – when I bottled it the gravity was .998, and it has surely attenuated more over the years. The flavor is subtle and unlike anything I have ever tasted – dry without a hint of sweetness, with a gentle tart finish that holds a suggestion of bitterness like a memory on the tongue. The finish lingers and tastes remarkably of fresh raspberries, even after all these years. Perhaps I can finally take Charlie’s advice to heart, and learn to relax and not worry. I still have ten bottles left. My son says it tastes like raspberries and old people!